The products can be each easily used as stand-alone products. 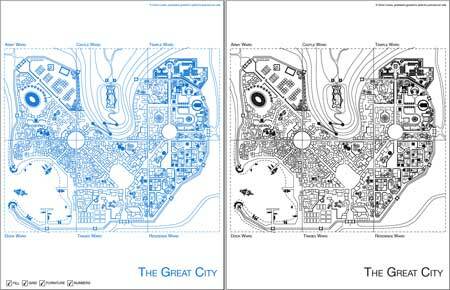 The Great City provides you a great map, both contained in one sheet for easy reference and split in six sheets (districts). Each district, or “ward”, features a main road on its edges. This allows you to easily identify the borders of a ward and easily join the maps to form a 25,5 x 22 inches map. In the future some “alternative” wards may become available, allowing you to replace one ward you don’t want on your city (for example, the city may cease to be a coastal one by simply removing the dock ward and replacing it with another ward). The Great City is the crossroads of cultures and people. A highly tolerant city, ruled by a fistful of wise men and women. The city lives of commerce and business; a popular saying tells: “You can find everything in the Great City and if you can’t find it, well, you’ll do soon”. The city rises on the coast of the ocean and is overlooked by and ancient castle towering from a small, green hill. The castle, its origin unknown, is now the residence of the Lord of the City. Some great and well-defended gates allow the entrance in the Great City from various points, and a mighty wall encircles the whole city. The city is divided in six different wards: Dock Ward, Trades Ward, Residence Ward, Temple Ward (which also includes the City of the Dead, the cemetery), Castle Ward and Army Ward. Also it is said that a huge dungeon complex lies below the Great City. Someone knows it as The Dungeon Under the Mountain. 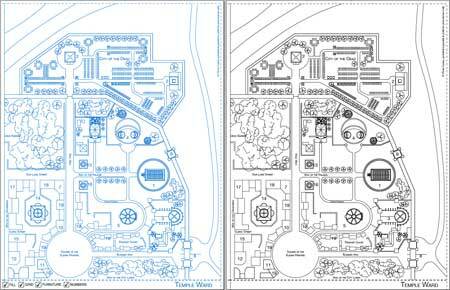 Melding technology with tradition, this set of maps is desig ..